Originally colonized by Spain, it eventually became divided into two colonies, the Spanish-ruled, Santo Domingo, and French-ruled, Saint-Domingue. Although mainly a peaceful community, the 2004 coup d'etat of Haiti President Jean-Bertrand Aristide caused conflicts between the Haiti National Police and the local para-military. The outcome produced a death toll of three, and incurred wide-spread destruction of homes and farm animals. 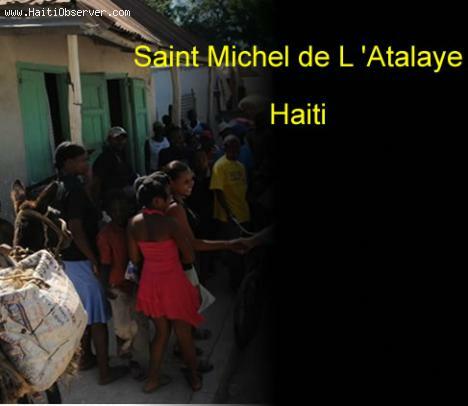 Saint-Michel-de-l'Atalaye celebrates its patron, Saint Michel's feast day, every May 8th. In contradistinction, voodoo adherents, who've absorbed Christian theology, travel to nearby Grotto Saint Francis de Asis and make offerings to the many deities of their voodoo faith there. The most recent projects to improve Saint-Michel-de-l'Atalaye's infrastructure include a nearly-completed and government-sponsored housing development; a vocational program in woodcrafts creation and manufacturing; and Saint-Michel-de-l'Atalaye's new City Hall, a green-energy building.